If you’ve been watching Breaking Bad, you’re likely of the same opinion that ABC’s hit show is just as addictive as the methamphetamine cooked by its protagonist/antagonist Walter White. And, if you’re up to speed with season 5, the (tragically) final series of the compelling crime drama, you will also likely agree that the most recent episode, ‘To’hajiilee’, is one of the best in the show’s long run. To’hajiilee saw Walter’s mask slip as his alter-ego Heisenberg succumbed to a devious trap by the DEA after leading them directly to his buried drug money, but, despite being cuffed and bundled into the back of brother-in-law Hank’s police car, there would be a further, killer twist to come. With the game looking over for Walt, Todd and his Nazi family rolled on into the desert armed to the teeth before a frenetic gun fight with Hank and partner Gomie faded to black without us knowing what the hell happened next. If you reacted like we did, staring wide-eyed at the screen screaming at the top of your lungs “You can’t end the episode like that!” then you too probably have one or two questions about the episode’s mother-of-all-cliffhangers. And here, we put the microscope over 5 Potential Outcomes From To’hajiilee. 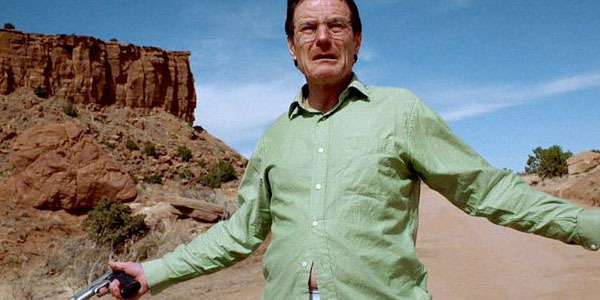 The post Breaking Bad: 5 Potential Outcomes From To’hajiilee appeared first on WhatCulture!. “I will never see the inside of a jail cell”, DEA super sleuth Hank is informed by his brother-in-law and occasional “methstermind” Walter White. And we know he’s right. The question that propels the final instalments of Breaking Bad is…why exactly won’t Walt do time? Will future family get-togethers be one, or two people short? At this point, there is no moral compromise that Walt won’t make, and his world is darkening quickly. He’ll be forced to walk away from the one person who doesn’t judge him, and still sees him as Walter White, his infant daughter. In her, Walter sees a part of himself, untouched by the darkness of Heisenberg. Losing Holly is losing “the good Walt”, and everything that comes with it. Walt has money by the forklift, but he’s not winning. This cash is feeling dirtier by the day – Jesse can’t give his blood money away fast enough. What’s striking is how believably Breaking Bad portrays acquiring wealth beyond your dreams and still existing in abject misery. You realise the cliche’ “Money can’t buy happiness” may not be the flaccid battle cry of the desperate. Never has money been so devalued as when someone complains they had to “spray it for silverfish”. We know from the flash forward that Walt is living on the lamb alone, under an assumed identity and with a machine gun in the trunk of his car. His Heisenberg persona is now infamous and no doubt a legend in Albuquerque and beyond. He’s apparently lost his family, but not his money – and he has a plan, which doesn’t look pretty. The show has a lot of plot to cover with the last seven episodes. Looking out from underneath the brim of the black hat, Walt’s perspective is pretty grim. The collision of worlds will be catastrophic as Heisenberg is outed and Mr. White (or the illusion of) disappears forever. He’ll walk away from everything eventually, presumably alone. Walt’s family will discover the grisly nature of his secret crimes, and having alienated everyone, including his long suffering business partner Jesse, Walt finds himself alone in a world he can no longer control, once again represented by the brief close-up of a fly. The fly harkens back to an earlier episode (The Fly, Season Three) when Walter becomes obsessed with presence of the dirty insect in his immaculate laboratory. It was the only problem he could control, and therefore became his fixation. Walt managed to reign things in back then, but now it’s time to pay the piper. Who’s the piper? That remains to be seen. There are several individuals that would qualify for “piper” status in this case. For those who think this half of the last season will end in a clash with pesky jobsworth Hank, don’t forget the many loose ends that need tying up – perhaps literally. The Mexican cartel might hold a grudge for the murder of their bell-ringing patriarch. After losing face in such an unforgettable manner, so might Gus Fring’s mafia-connected family. It wouldn’t even be difficult to locate Walter, as he’s lived in the same single level ranch style house since he was a nerdy high school teacher. Creator Vince Gilligan questions “Who are we cheering for and why?” with the character transformations in Breaking Bad. It’s easy to see why Walter White has been cut so much slack, but how much are we willing to forgive? Barring violence on innocents, how far can a villain protagonist be pushed before losing an audience? Any fans of the show hoping for a possible open-ended finale can surrender hope; Gilligan says “people should expect a real, conclusive ending”. Aaron Paul laments the end of Breaking Bad and doesn’t want it all to end, but says “I’m so happy [the writers] ended it the way they did”, and promises “a dark, crazy ride to the final episode”. The post Breaking Bad Final Season – The Beginning Of The End appeared first on WhatCulture!. Bless your heart, Aaron Paul. On Friday, the Breaking Bad star did the unthinkable – he shared a spoiler from the show’s current, final season. OK he posted a cute shirtless photo of himself, Bryan Cranston and the wonderful Anna Gunn (not shirtless). While it’s highly unlikely that this is how the show will end, Paul’s photo is just another reminder of how much we love these people and how much we’ll miss Breaking Bad when it signs off for good later this month. Breaking Bad, with three episodes to go, wraps Sept. 29.